Tens of millions of Americans have hit the road this summer. The all-American road trip has long been a signature adventure, but once upon a time the notion of your own motorized excursion of any length would have seemed impossible. In 1900, Americans were hampered by wretched roads and limited by the speed and endurance of the horses that powered buckboards, coaches, and wagons. If they had an urge to travel far distances, they had to rely upon the steam locomotive. As fantastic as it might have seemed at the turn of the 20th century, the idea of supplanting the iron horse with the horseless carriage did catch the fancy of some intrepid men and women. Eager to test the technological limits of their new contraptions, a few hardy souls set off upon far-reaching expeditions between 1900 and 1910. At the same time, some city dwellers simply sought an escape. Early 20th century urban environments had their drawbacks: sidewalks overflowing with scurrying pedestrians; streets crowded with unending waves of trolleys, delivery wagons, carriages, and pushcarts; the persistent stench rising from mounds of horse manure; raw sewage emptying into open gutters; rotting piles of uncollected garbage and dense clouds belching from factory smokestacks. In its infancy, however, an automobile could not deliver most Americans from their urban frustrations—for most Americans could not afford to own and operate one. At a time when average annual salaries might not reach $500, many automobiles might cost between $650 and $1,300, securely beyond the grasp of all but the wealthiest. Moreover, with few garages, filling stations, and dealerships outside of city limits, even the infrastructure required for the care and feeding of the automobile could be difficult to locate and could drain the motorist’s wallet. During their earliest years, neither automobiles nor auto touring could be considered within the reach of the masses. Automobility would only become pervasive over time, thanks to rising wages, falling prices for used cars, expanding opportunities to buy these machines on credit, and, especially, the introduction of Henry Ford’s revolutionary Model T in 1908. Even for those Americans who could afford the first horseless carriages, to go off the few familiar paths in most parts of the country, especially in the great distances of the trans-Mississippi West, required a large measure of self-reliance. 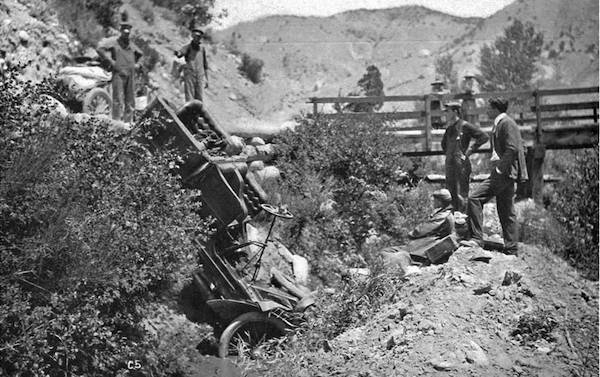 One motor traveler characterized the roads of his native Wyoming in 1909 as “deep ruts, high centers, rocks, loose and solid; steep grades, washouts, or gullies . . . ” He went on to note that, “unbridged streams; sand, alkali dust; gumbo; and plain mud, were some of the more common abominations.” Between the obstacles presented by such abysmal road conditions, the likelihood of frequent mechanical breakdowns, and the rarity of supplies to sustain driver and vehicle, these early outings always required an audacious spirit. Aspiring long-distance auto tourists back then were counseled by self-proclaimed experts to carry abundant quantities of supplies. Those who made the first transcontinental drives between 1901 and 1908 hauled along ropes, blocks and tackle, axes, sleeping bags, water bags, spades, camps stoves, compasses, barometers, thermometers, cyclometers, first aid kits, rubber ponchos, tire chains, pith helmets, assorted spare parts, and sufficient firearms to launch a small insurrection. Mary C. Bedell’s impressive list of gear, published in her entertaining 1924 account of auto touring, Modern Gypsies, typifies what was carried by the most dedicated motor campers both in scale and variety: “tent, duffle bags, gasoline stove, Adirondack grate and a kit of aluminum kettles, with coffee pot and enamel cups and saucers inside”—an array of equipment that added “four or five hundred pounds” alone to the weight of the fully loaded automobile. A car so laden, puffing along western trails, bears a striking resemblance in the mind’s eye to a hermit crab staggering across the ocean floor burdened with its house on its back. Even as motoring Americans loaded up their cars with the contents of their local hardware stores, however, the growth in their numbers year by year provided alluring prospects to entrepreneurs in small towns and great cities throughout the West. 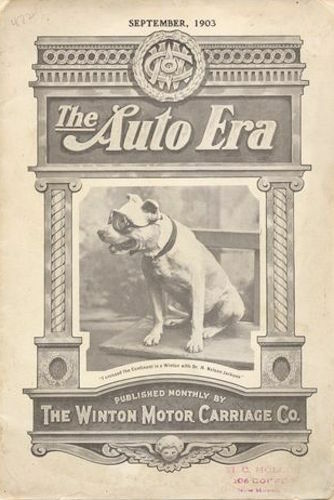 Garages, gas stations, roadside cafés, and diners began to pop up along more frequently traveled routes while hotels, restaurants, and general stores started to advertise in the earliest guidebooks produced by organizations such as AAA and the Automobile Club of America. Following the lead of Gulf Oil in 1914, gasoline retailers commissioned maps branded liberally with their logos for free distribution at their service stations. Motorists once left entirely to their own devices now encountered a rapidly evolving infrastructure of goods and services. Meanwhile, governments at the local, state, and federal levels began to invest increased engineering skill, construction efforts, and tax dollars in road improvements. While motor tourists by the end of the World War I might still encounter 10,000 miles of battered gravel trails littered with potholes for every 10 miles of carefully surfaced and maintained roads throughout the country, the increasing pace of improvements made it far easier to drive through the West than it had been for those who had attempted such a journey only a decade before. While Dix fell far short as a prophet of social or technological developments, his sense of how inextricably linked the automobile would become in the leisure pursuits of Americans has been thoroughly borne out by the evolution of the American road trip. is H. Russell Smith Foundation curator of western historical manuscripts at the Huntington Library and editor of Motoring West Volume 1: Automobile Pioneers, 1900-1909. He wrote this for What It Means to Be American, a national conversation hosted by the Smithsonian and Zócalo Public Square. Primary editor: Becca MacLaren. Secondary editor: Andrés Martinez. *Lead photo courtesy of courtesy of the Huntington Library. Interior photos courtesy of the Huntington Library and Smithsonian National Museum of American History, Transportation Collections.